It was a very popular story of the time that two friends were there and they are working in a shoe company. The shoes were made in the company and the work of both of them was to go to the market to sell shoes. Once the owner of the company sent him to sell shoes in one of the villages where everyone was barefoot and did not wear sandal or shoes. The first goes to the village of Banda and it becomes disturbed by seeing the people there that if no one does not wear shoes here, then here I will sell my shoes, thinking it comes back. Then the second friend goes to the village and it is very happy to see that no one here is wearing shoes, now I can sell all my shoes here, I have many customers here. 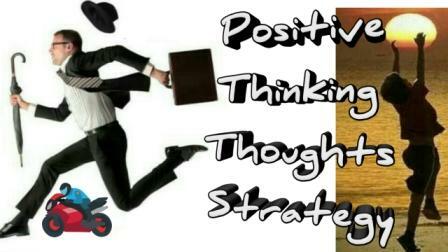 So, friends, that is the difference between positive thinking thoughts and negative thinking thoughts. The world is equal to everyone and there are possibilities to do good everywhere, but the person of negative thinking also turns his face away by looking at the path and the positive thinking person makes a path even in difficult situations. Nothing is impossible in the world, just thinking should always be positive. Positive thinking is not a boon that only happens with those gurus who teach the way to live. It can be adopted by everyone. Nowadays, positive thinking of a pessimistic ideology makes people feel comfortable as a shelter, which can help you. Here are some suggestions that can result in you becoming a positive person by practice. Sometimes you have to admit that you will not think anything negative and will be victorious over the negativity spread around you, giving a new direction to your point of view of life. People always make the biggest mistake by giving others the opportunity to run their life. You should refrain from doing so at all costs and take all important decisions related to your life. The scientists believe that at the time of meditation, when the brain remains focused on a particular idea, then energy dissipates. This energy brings strength inside the human being so that it is able to cope with difficult situations in ordinary life. Try meditation for at least 10 minutes every day. Choose a dark room where there are no obstacles and deep breaths and eyes closed. Remove all thoughts from your mind. In the beginning, this process will be difficult but practice will make it very easy. In this world, every human has an ideology about any subject. Meeting people with positive thoughts will move your thinking and purpose in a positive way, while people with negative thinking will remove the positivity from your life. Stay with people who give you positive vibes. You will surely feel the change in yourself. Choose your goal according to your desires. Always keep on waiting for it, no matter how difficult it is. Learn to trust them and work hard to get them. There are many new ways to give the world to you and if you adopt them with an open mind and optimistic thinking then your life will change. Work hard and move your goal one step further every day. Once you have found it, you will be able to take the challenge of taking new risks. After achieving every small or big goal, you will have confidence in your ability. Under what circumstances do you react, it can make a difference in your thinking ability. Giving positive feedback in a difficult situation makes that situation easy and you can easily recover from it, whereas negative ideology seems more difficult than necessary. By changing the way you think, you will be able to see the world with a new perspective and you will see how beautiful the world is, even today you did not even imagine it. you can read -Honesty is the best policy for a successful mind? Resisting any change involves human nature. But when you question yourself that what is the purpose of this resistance, you will not see yourself as difficult as you thought. Therefore raising a question on your motive will reduce your defensive nature and give you the power to see the possibilities so that your experience increases. You should keep in mind that positive thinking brings positivity while adverse thinking people call themselves negativism. So by thinking positively you are keeping yourself open for new possibilities and making your life worth living.